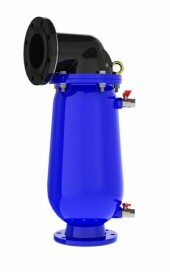 The D-026 Combination Air Valve combines an air & vacuum orifice and an air release orifice in a single body. The valve is specially designed to operate with liquids carrying solid particles such as wastewater and effluents. The combination air valve discharges air (gases) during the filling or charging of the system, admits air into the system while it is being emptied of liquid and releases accumulated air (gases) from the system while it is under pressure and operating. The valve’s unique design enables the separation of the liquid from the sealing mechanism and assures optimum working conditions. The orifice plug-disc linkage assembly is external, placing the levers and pins outside the air valve body and its corrosive atmosphere. Available in flange size: 150mm (6"). Valve body and cover made of Ductile Iron ASTM A-536 60-40-18. Valve coating: fusion bonded epoxy coating according to standard DIN 30677-2. Operating parts are made of specially selected corrosion- resistant materials. All inner metal parts made of stainless steel. Air valve also available in Halar and other coatings. Additional one-way option for air intake/discharge only as well as an additional non-slam option. Install at pump stations for sewage, wastewater & water treatment plants and on wastewater, effluent water and sea water supply lines.